If you use Windows operating system on your PC, you would be familiar that Microsoft only provides support to an operating system for a fixed time frame. This means Microsoft specifies a date for the end of support(mainstream/extended) for every operating system. Recently Microsoft has officially put an end on the mainstream support for Windows 8.1. However, the extended support will continue till January 10, 2023. Last year Microsoft provided free upgrade to all its users to Windows 10. But in case you missed out on the free upgrade or you opted to continue with Windows 8.1 then you will be bit disheartened to hear that on 9th January 2018 Microsoft ended mainstream support for it. This means that that Microsoft will not provide any new features, upgrades or improvements for 8.1. The only consolation is that the security patches and updates for 8.1 will remain available till January 10, 2023. However, after that complete support will be ended like the one ended for Windows Vista in April 2017. For users who are not much aware about the extended support, please note that once Microsoft ends the extended support as well, your PC will become more prone to virus and malware attacks. This is because Microsoft after the completion of extended support Microsoft doesn’t even provide security patches for the dreadful viruses or infections. Why has the Company Ended Support? It’s not a new thing when it comes to ending support for Windows operating system. If we talk about Windows Vista then Microsoft has ended its mainstream support on April 10, 2012 along with extended support which ended on April 11, 2017. Also, mainstream support for Windows 7 was also ended on January 13, 2015. However, the users who have Windows 7 will be entitled for the security patches and updates till January 14, 2020. Moreover, Microsoft has a fix support cycle for all its operating system. This means that the support for latest operating system i.e. Windows 10 too will end, i.e. on October 13, 2020 with complete end of support on October 14, 2025. Microsoft wants to shift all its users who are still on older operating system to Windows 10. 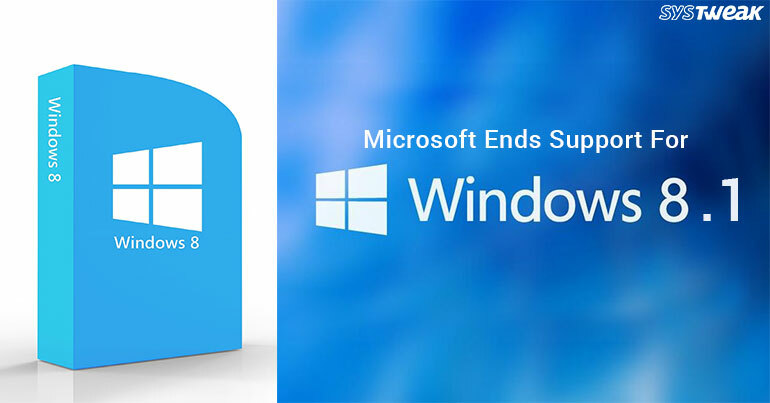 This end of support will surely compel all the users of Windows 8.1 to upgrade to Windows 10. As, Windows 8.1 is the only obsolete version which was receiving the support till 9th January 2018. This will also help Microsoft to focus more on providing new updates and features to Windows 10. So, if you wish to stay updated with all the recent features and upgrades then we recommend to upgrade to Windows 10, if not already done.